I just hope nobody from the Syfy Channel sees this. They certainly raised the bar on cheesiness with their Sharknado movies, but this could break the cheesy barrier. 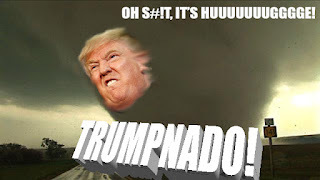 The forecast for all primaries, caucuses and yes, the big day in November, is the same: severe shitstorms followed by Trumpnado! Trumpnados feature way too much hot air. Yes, but today the LA Times had an article about the Democrats and Independents that like him. Go figure. Tell us how you really feel, Norma! You and Collin should write for CNN and the Comedy Channel. William: at least an F20! Mari: There are some Democrats and Independents who will vote for him rather than support Hillary Clinton if she's the nominee. Eve: We'd love to write for Comedy Central! Just when I start to get tired of hearing about the candidates, up comes a new joke. Like Trump and Cruz fighting over their wives??? Who cares! I can't even follow the election... it is crazy! Cheryl: It's like high school. I hated high school! Hilary: I'll be glad when it's over! I'm just counting down the days until it ends! When he first decided to run, he said he was going to make an announcement that would make everybody happy. I thought that meant he WASN'T going to run! 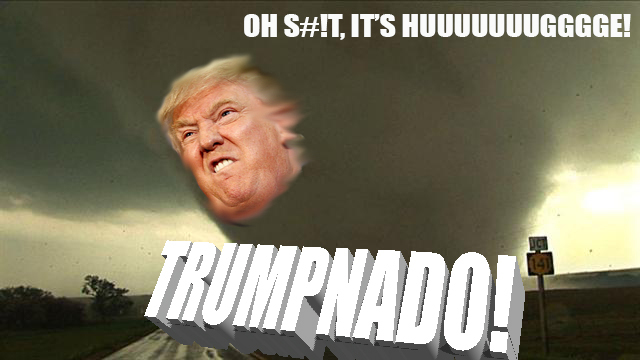 Trumpnados. That's a little funny and sad.